Alexander Paraskevov Angelov is the ultimate beneficiary of the offshore “Viafot” Ltd., registered in the British Virgin Islands, according to the “Panama Papers” to which journalists of Bivol received access under an agreement with the International Consortium of Investigative Journalists ( ICIJ). Anguelov is the closest and most trusted lawyer of media mogul and controversial lawmaker from the party Movement for Rights and Freedoms (DPS), Delyan Peevski, and the son of a powerful officer from the sinister “Bulgarian KGB” – the Communist regime’s secret services – the State Security (“Darzhavna Sigurnost” or DS). “Viafot” is the owner of the Bulgarian company “Viafot Investment Bulgaria”, which in the last two years had been attempting a takeover of the weapons factory “Dunarit” in the Bulgarian Danube city of Russe with the support of all State institutions. The owner of “Dunarit” Emiliyan Gebrev complained in a TV interview that after he had agreed to become part of the factory’s ownership, he had been attacked by the repressive machine of the Prosecutor’s Office and the National Revenue Agency. There had been even a physical assault of the businessman and his son. “Dunarit” is associated with the former majority shareholder and owner of the collapsed Corporate Commercial Bank (CCB) Tsvetan Vassilev and “Viafot” with Delyan Peevski. The two were close until 2014, when a falling-out between them led to the Bank’s collapse. The profitable factory remained under Vassilev’s control, and the takeover attempt is a logical continuation of the war for the CCB’s inheritance, in which the companies associated with Peevski enjoy the support of the State. MP Delyan Peevski is considered to be the visible symbol and emanation of the “Deep State” in Bulgaria – as a front of former State Security officers and agents, close to the DPS party and to the Bulgarian Socialist Party (BSP), who are the backstage masterminds of the political processes and who dominate huge businesses. The events associated with Peevski are characterized by brutality and blatant neglect of laws and rules. Peevski is often called a “child prodigy” for having had an unexplained stellar career and business since 2001. At that time he rose on the political horizon as a young man with high school education who suddenly became the Director of the Port of Varna, followed by the post of political secretary to the Minister of Transport, followed by a career as magistrate, lawmaker and deputy minister without the necessary qualifications and biography. Since 2007, after having received unrestricted financing from the CCB and personally by Tsvetan Vassilev, Delyan Peevski is the owner, controller and monopolist of the media market in Bulgaria. In 2013, when the BSP came to power and formed a government led by Prime Minister, Plamen Oresharski, Peevski was elected Head of the National Security Agency (DANS) in an extremely outrageous manner, which sparked massive protest rallies that led to his resignation and to the resignation of Oresharski’s government. Called by Spiegel magazine the “Iceberg of Corruption” in Bulgaria, Delyan Peevski has been continuously expanding his business empire and political influence over the years, regardless of the political situation. His mentors are the masterminds of the political and social model known as #WHO, a model creating the lasting feeling in Bulgaria that not the particular Prime Minister, but namely # WHO runs and controls everything in the country. Angelov argued publicly in 2015 that he was not Peevski’s lawyer and knew him only “for three-four years”. Questions about his relationship with Peevski were asked in connection with Angelov joining the management of the football club “Levski”. Alexander Angelov is a member of the boards of directors and represents key enterprises from the business empire of Peevski and of Peevski’s mother, Irena Krasteva, such as the “Rodina” Publishing House, the “United Bulgarian Newspapers”, the newspaper Standart and others. For many years, Delyan Peevski did not declare any property, except for an old “Opel” automobile, despite numerous indirect evidence that he controls a massive business. He began to shed light on his property only after 2016, and at the moment he is the wealthiest lawmaker in the Bulgarian Parliament, where he very rarely shows up. Nevertheless, the declared property is still the tip of the iceberg of Peevski’s assets, as evidenced by a leaked portfolio of the associated with him company “TGI Middle East”, registered in Dubai. One of the key assets associated with Peevski is the Bulgarian cigarette holding and tobacco manufacturer “Bulgartabac”, privatized in 2011. According to Tsvetan Vassilev’s public statements, Alexander Angelov is the person who had compiled and had sent to Vassilev’s email address the scheme for the privatization of “Bulgartabac”. The scheme had also included the names of three offshore companies that have had to set aside a 10% commission for Bulgarian Prime Minister Boyko Borisov, his friend Alexander Staliysky and Ahmed Dogan, the former leader of the DPS and the Movement’s Lifetime Honorary Chairman, as Vassilev claims. However, a check by Bivol revealed that the offshores had been closed not long after the privatization deal. Vassilev further claims that Angelov has brought to him a list of companies and assets that Peevski had wanted to obtain from him in the midst of their conflict, just before the CCB’s bankruptcy: “This list came from Peevski, it was brought by his lawyer Alexander Angelov. This is a pure racket,” Vassilev said in a TV interview. “Let’s sit down together, the four us – me, Peevski, Alexander Angelov and Bisser Lazov and see who is lying,” the banker suggested, as the TV host remarked that the list was just a piece of paper. In 2009, Angelov together with attorney Geno Andreev created the consultancy company “Aviora Consult”. Geno Andreev is also featured in documents related to Bulgartabac and other companies from the MP’s business empire. Bivol first mentioned the name of Geno Rumenov Andreev in the publication “Bulgartabac Mafia“. In addition, he is listed as one of persons who may be appointed as managers of BT INVEST. Geno Andreev was also appointed for some time as Chairman of the Board of Directors of Technomarket Bulgaria JSC in mid-2016 when Peevski was majority owner of the company through TGI Middle East, which Bivol investigated in detail. Andreev’s father, Rumen Andreev, is a longtime head of the National Investigation, a former Deputy Interior Minister during the term of another Socialist Prime Minister – Sergei Stanishev (now leader of the Party of European Socialists, PES). Andreev has an impressive CV as a State Security officer, including training at a KGB school in Moscow. He committed suicide last year amidst strange circumstances. It was never reported in the media and the reasons remain unknown. Peevski, himself, received his first appointment as an investigator at the fragile age of 24 at the suggestion of the same Rumen Andreev, then a member of the Supreme Judicial Council (SJC), and with the lobbying of the close to DPS then-National Investigation Head, Angel Alexandrov, who also died under unexplained circumstances last year. Meanwhile, Alexander Angelov’s father – Paraskev Paraskevov sits on the board of “Aviora Consult”. Paraskevov started and spent his entire career as a high-ranking officer in the former State Security, in the so-called counterintelligence, mainly spying against Turkey. He is remembered as one of the most successful DS recruiters, as some of his agents “grew” to become lawmakers and journalists in the transition period after the fall of the Communist regime. In 1990, he was appointed Deputy Director of the National Service for the Protection of the Constitution. It is the State Security’s heir by ideology and staff. It was renamed later and its successors are the National Investigation Services (NIS) and DANS. After his retirement, Paraskevov has worked as an insurer close to the infamous “Intergroup”, associated with mafia boss Poli Pantev, dramatically executed in Aruba 18 years ago. In 1994, during the term of the Socialist government of Prime Minister Zhan Videnov, Paraskevov was appointed Deputy Interior Minister in charge of National Security, including the-then National Service for Combatting Organized Crime (NSBOP). He remained at the post until the beginning of 1997. At that same time, his colleague Rumen Andreev was appointed Deputy Director of NIS. On July 20, 2017, the exiled in Belgrade former CCB majority shareholder, Tsvetan Vassilev, sought protection by the United States under the “Global Magnitsky Act “. Vassilev filed his complaint with the US Department of Justice, claiming that he had been subjected to political repression in Bulgaria because of his attempts to oppose the corruption model in the country. He directly accuses Delyan Peevski and Prosecutor General Sotir Tsatsarov of criminal and repressive activities. In response and as a defense strategy, Peevski filed an objection to these charges on August 29, 2017. Under US law, US consulting companies are dealing with both claims for whose services Vassilev pays USD 50,000 a month and Peevski – USD 30,000 a month, plus the extra costs. The consulting companies, in turn, are approaching and lobbying with various US politicians, members of the Congress and the government. Namely, “Aviora Consult” has concluded a contract with a lobbying firm in the United States by to defend Delyan Peevski from Tsvetan Vassilev’s accusations under the Magnitsky Act and namely Paraskev Paraskevov’s signature stands under this contract. Namely, Paraskev Paraskevov’s signature stands under the contract with a lobbying firm concluded in the United States by “Aviora Consult” to defend Delyan Peevski from Tsvetan Vassilev’s accusations under the Magnitsky Act. The former DS colonel Paraskev Paraskevov, father of attorney Alexandre Angelov is leading the defense of MP Delyan Peevski against the Magnitski Act accusations in the USA. What is the origin of lawyer Alexander Angelov’s nearly BGN 40 million? In the “Panama Papers, “Viafot” appears as early as 2013. It has been registered by the law firm “Mossack & Fonseca” at the request of a Cyprus partner company that operates in Bulgaria. The British Virgin Islands register lists the ultimate owners and directors who are Cypriot citizens. The scandal with the Panama papers broke out in the spring of 2016, and “Mossak & Fonseca” found themselves in the epicenter of criticism and corruption investigations. It turned out that for many years the law office had been hiding the real owners of offshore companies involved in money laundering and concealing the wealth of political figures. Therefore, after the scandal, “Mossak & Fonseca” launched an inventory of all companies for which the registers lack data about the ultimate beneficiaries. In December 2016, information on the owner of “Viafot” had been requested via email. The declaration sent to the Panamanian office and signed by Alexander Angelov states that the company does not carry out any activities and the source of wealth is listed as loans from the beneficial owner, Angelov himself. The countries where the company operates are not designated. 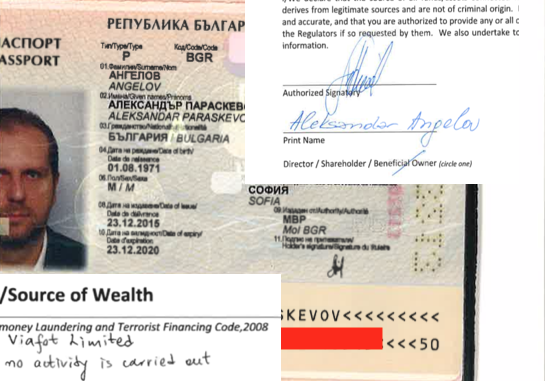 Copies of Angelov’s passport and ID card are attached to the declaration. However, Angelov’s declaration does not correspond to the factual situation. “Viafot” is operating in Bulgaria and for a lot of money. As the KTBFiles (CCB Files) project writes, in March 2016 “Viafot Investment Bulgaria” bought from Italian businessman Edoardo Miroglio through a transfer (cession), the receivables of his company “E. Miroglio” from “Dunarit”. The preliminary cession agreement is dated December 4, 2015. At the time when the Italian businessman owned assets of “Technomarket” and “Dunarit” the “unfortunate incidents” in his life somehow got more frequent. Miroglio was in a severe car crash in southern Bulgaria in which two of the people travelling with him were killed – two women on the backseat without seatbelts. The crash happened in broad daylight and in good weather and had not been provoked by an outside cause. It just left the road. One theory is that the driver had fallen asleep behind the wheel. People close to the businessman say that none of the two survivors (Miroglio and the driver, who, both, had been wearing seatbelts – the only thing that saved them) remembered anything from the moment just before the crash. After the crash, the Italian’s shares in Technomarket fell into Peevski’s hands. Miroglio later transferred his assets in “Dunarit” to the “Viafot” offshore. After the disclosure of Alexander Angelov as the undisputed ultimate owner of “Viafot”, the question arises as to the origin of the EUR 19.563 million that “Viafot Invest Bulgaria” paid for the transfer. If the money is his own, has he declared it and paid taxes on it? “I do not care what this is about. I do not want to comment on anything related to you. Am I clear enough?” is how Angelov cut us off and abruptly hung up the phone. Is Angelov a proxy or a puppeteer? As Bivol’s investigations into TGI Middle East revealed, the business empire linked to Peevski has been growing through the years and has exceeded the threshold of USD 1 billion. In addition, the cigarettes factory Bulgartabak, also linked to Peevski, is involved in large scale smuggling of cigarettes in the Middle East. However, the questions and the speculations about Peevski’s true role and whether he is an “independent player” or a puppet, a front for other powerful shady people who act behind the curtains, date from a while back. The fact that Angelov, a person so close to Peevski and so much trusted by him, is the ultimate beneficiary and owner of the offshore, is very important, because, on the one hand, it indicates the MP’s interests in “Dunarit” and on the other – it shows that in the system established by the country’s backstage rulers, Peevski does not seem to be a decision maker. It is obvious that Peevski does not own assets directly. They are owned by individuals such as Angelov and Geno Andreev, people who are “blood-related” to the State Security (DS) through their fathers. This structure also means that the “successful young man” (Peevski) can be replaced anytime by another puppet, without the collapse of the “Captured State” which will continue to function. The “Panama Papers” are 11.5 million leaked documents that detail financial and attorney–client information for more than 214,488 offshore entities. The documents, some dating back to the 1970s, were created by, and taken from, Panamanian law firm and corporate service provider Mossack & Fonseca, and were leaked in 2015 by an anonymous source to the German newspaper Süddeutsche Zeitung. The German journalists shared the archive with the ICIJ and the Consortium worked with journalists from over 100 countries. Bivol, which since 2012 is a member of another leading international consortium of investigative journalists, the Organized Crime and Corruption Reporting Project (OCCRP), was granted access to the documents on the basis of an agreement between its journalists and the ICIJ and Süddeutsche Zeitung. So far, the information on Bulgarians in the Panama Papers has been published exclusively by the newspaper 24 Hours. However, the newspaper has not published any information on companies and individuals associated with lawmaker and media mogul Delyan Peevski.